First, determine what kind of faucet you have by looking underneath it. If you see a setscrew, it’s considered a “slip-on” faucet. If it doesn’t, it’s considered a “screw-on” faucet. Purchase a replacement faucet in the same style as your old one. Then, use your hex wrench to unscrew the setscrew and remove it (slip-on faucets) or rotate the faucet counter-clockwise to unscrew it (screw-on faucets). Gently remove the faucet from the wall. For a slip-on faucet: place the new faucet over the protruding pipe and tighten down the setscrew. 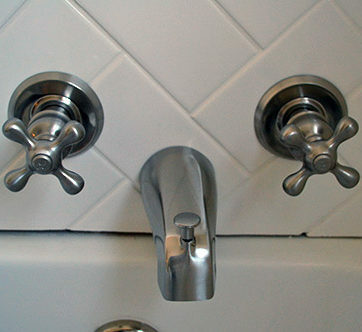 For a screw-on faucet: rotate it clockwise until the threads catch and you can tighten it to the wall. If the pipe in your wall protrudes too far, too little, or its threads are too corroded to use, remove the old pipe and install a new pipe that fits correctly with your new bath faucet. Remove the handles from the wall. If there are round “plates” underneath the handles, remove them from the wall as well. Install the new plates and new handles and tighten the screws down to secure.